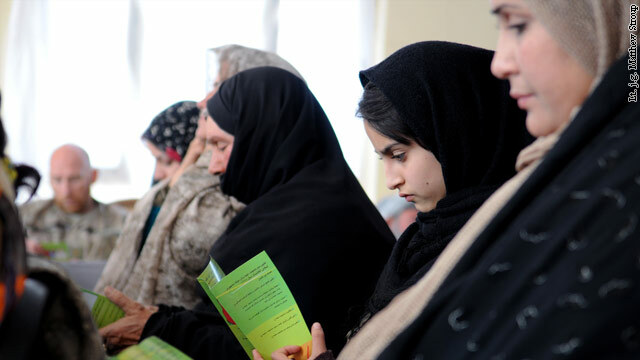 Afghan women and a U.S. military observer look at a pamphlet distributed during a meeting of provincial leaders on women's issues in Farah, Afghanistan, December 6, 2012. It's become one of the most dangerous jobs in the Afghanistan government. Six months after a car explosion killed the head of the women’s affairs department in Eastern Laghman, in the province of Kandahar, her successor, Najia Seddiqi, was shot to death by two gunmen on her way to work on Monday morning. The murders have brought to the fore, once again, the fragile standing of women in Afghanistan, 11 years after the Taliban were ousted. As the United States and other countries prepare to exit in 2014, there is significant concern that women's rights could disappear in Afghanistan's conservative Muslim society. Over the past 10 years, there has been modest but tangible economic progress from the regressive rules women have lived by under the Taliban. Under President Hamid Karzai, there has been improved access to health care, technology and education, which have all dramatically raised the quality of life for Afghan women. Secretary of State Hillary Clinton highlighted some of that progress in March 2012 at the U.S.-Afghan Women’s Council, noting that since 2001, life expectancy for women in Afghanistan has lengthened from 44 to 65 years; back then, almost no girls went to school, and today, 3 million attend school; and now nearly 500 women are on university faculties. Experts say that support from the United States and the international community has been essential in rescuing the country from its dark days of Taliban rule. “Women in Afghanistan don’t live their lives as we do in the West, and they are not going to anytime soon, but the women I know in Afghanistan will never give up,” said Dr. Isobel Coleman, director of the Women and Foreign Policy Program at the Council on Foreign Relations. “But the question is, with so much progress since the dark ages, how much Afghans are ready to fight - perhaps even among themselves - to protect these rights?" The attacks, like the assassinations of Seddiqi and her predecessor Safia Ahmed Jan, are not new, and they are part of an ongoing strategy by the Taliban to create fear among reformers, especially women who are now more than ever taking official seats in the Afghan government, Coleman said. Coleman recounts an encounter she had with Shukria Barakzai, an Afghan politician and women’s rights activist who confessed to Coleman that she is aware of the high risk of assassination at any given time. However, like many other Afghan women who have lost their lives to this battle or are still struggling to advance its gains, Barakzai, a mother of three girls, is still optimistic. “I do what I do, and will continue what I’m doing and if I die, I die. I die to give my girls a better life,” Barakzai told Coleman in an interview in Afghanistan. Clinton and the Obama administration have been keen supporters of women’s rights, but with the Karzai government looking for ways to coexist with the Taliban, such reforms have and are still subject to scrutiny and politics. “The brutal murder of public officials has grown typical of this criminal insurgency,” said Gen. John R. Allen, commander of coalition forces in Afghanistan, after Seddiqi's assassination. “This violence against government figures is an affront to peace and makes a mockery of any pretense of the insurgency being part of the future of Afghanistan,” Allen said. He condemned these killings and expressed his support for the brave leaders of Afghan society who will not be deterred by these violent acts. Karzai also condemned Seddiqi’s murder. “Killing women is a coward act, which is against Islamic and cultural values of Afghanistan,” he said in a statement. Coleman argued that one way to assure women's rights don't revert to the dark ages after 2014 in an effort to placate the Taliban, the Afghan government should focus on consolidating its rule over the majority of the country that is stable. Clinton, in a statement issued this week regarding the killing of Seddiqi, noted that the United States’ focus on the issue will not end in 2014. A MASSIVE CONVERSION OF MUSLIMS TO CHRISTIANITY IS THE SOLUTION for global Islamic madness and violence. Absolutely the truth. The "Religion of Peace" is a sham! We in the West cannot make the world over in our image especially by occupying their country. These backwards looking tribesmen have long practiced what we would call barbarous behavior. It will take them several if not more generations to begin to practice social standards that we presumptuously call civilized! You should ask radical feminist Naomi Wolff who's a HUGE fan of the Taliban. 50 million girls in India have gone missing in 3 generations through practices like infanticide, feticide, deliberate starvation, dowry murders, bride trafficking, honor killings and witch hunts !!!! We need to demand accountability and action from the Indian Hindus and the Indian Brahmin government to stop female genocide in India forthwith. It is immoral, illegal, against all civilized norms, against the principles of most religions and above all it setting a bad example for all the neighboring countries. We strongly urge you to join this movement that is now ongoing on all social media. That is sooo sad. Manmohan Singh should resign. The "Religion of Peace" is what it's called, but everyone is absolutely terrified to call them out on their policy of jihad, honor killings and female genital mutilation. When the time comes for the coalition forces to leave there's going to be a bloodbath. But, we have to let them get on with it sadly. Why are we in the West so afraid of these people! Everywhere Muslims go these three facts of jihad, honor killings and female genital mutilation follow them. To the EU, Britain and to Canada. If it's happening in the States we're not hearing very much about it. But I'm sure it is and the liberal leftist media is controlling how to deliver the news. Anyway, don't roll over for these people! Watch who you let immigrate into your country. The enemy is already within! This is just further evidence that the Communists should have won there back in 1980 before the Russians intervened and now the women of Afghanistan wouldn't be having this problem today. It goes to show that foreign interference does far more harm than it helps! This was international stupidity at it's worse! Thank you, Joseph. I fully agree. The Communists should have won there and today, that part of the world would be peaceful. But then again, we have this all powerful M.I.C. in this country which is very war hungry and wants to make a great deal of money. FY Joseph what a stupin comment. Thank god J Edgar Hoover is not alive otherwise you would have been toast and deported back to India without an eye and a leg !!!! Please saurov, do cut the Tea Party lingo. It has no place here. They should do it by themselves. They do not live in America.